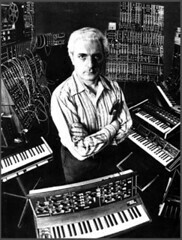 Robert Moog, electronic music innovator, passed away at his home on August 21, 2005. For those unaware, his Moog synthesizer was responsible for the sounds heard on countless recordings from the sixties, seventies, and beyond. Diagnosed with a brain tumor earlier this year, he battled the disease with radiation and chemotherapy. Mr. Moog, I never knew you personally, but I want to thank you for all you’ve done. The Wikipedia article on Robert Moog features some great information, including a snippet on how to pronounce “Moog” properly (apparently, it rhymes with “vogue”). Also, check out the Moog Music website. The photo pictured was originally uploaded to Flickr by Theremina. A septuagenarian named Frank “Little Sonny” Scott Jr. plays a homemade instrument made out of keys. Pretty cool. I’ve heard of wind chimes made out of old keys (which I’ve been saving some to create), but I’ve never actually heard of anyone making an instrument and earning a reputation for playing keys. Playing in key, maybe. I’d love to hear what this gent sounds like. Good thing he’s only 90 miles away. Vera Meyer playing Glass Harmonica, originally uploaded by romanedirisinghe. Once in Harvard Square, we stumbled upon the most fascinating street musician, Vera Meyer. She played an odd instrument called the Glass Harmonica, and was quite obsessed with Jay Leno and appearing on the Tonight Show. Vera ran through a gamut of songs with an audience member turning the crank on her instrument, and I was mightily impressed by the eerie sound. She informed us the instrument was rumored to make the musician go insane, but that she felt fine. I shrugged to myself as we walked away; sanity is in the eyes of the beholder. Boston T, originally uploaded by romanedirisinghe. This photo was taken shortly after we arrived in Boston yesterday morning. It was nice to be back in a city, and slough off the remnants of the Cape Cod Coma. We dropped off our bags at the hotel (check in wasn’t until 3:00 pm!? ), and started walking around immediately. We hopped on the “T,” Boston’s subway, and made our way to Harvard Square.